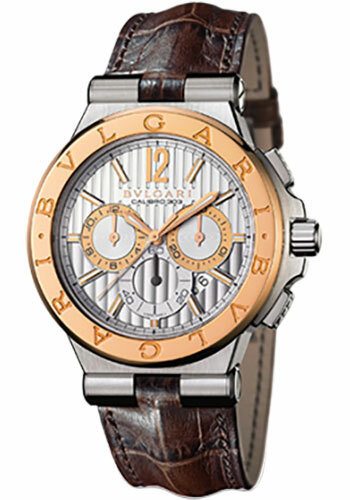 42 mm stainless steel case, transparent back, 18-ct pink gold bezel with Bulgari logo, sapphire crystal, silver dial with gaudronne pattern, BVL 303 automatic movement chronograph with column wheel mechanism, approximately 40 hours of power reserve, brown alligator strap, folding buckle with stainless steel. Water resistant to 330 ft.
42 mm stainless steel case, transparent back, 18-ct pink gold bezel with Bulgari logo, sapphire crystal, blue dial, BVL 303 automatic movement chronograph with column wheel mechanism, approximately 40 hours of power reserve, blue alligator strap, folding buckle with stainless steel. Water resistant to 100 ft.
We are not an official dealer for the products we sell and have no affiliation with the manufacturer. All brand names and trademarks are the property of their respective owners and are used for identification purposes only. © 2004-2019 SwissLuxury - Images are digitally watermarked.